President Obama and First Lady Michelle Obama announced last week that the annual White House Easter Egg Roll will be held March 28. It's the last Easter Egg Roll of the Obama administration. The event is held annually on the Monday after Easter on the South Lawn of the White House. It's open for children ages 13 and younger and their families. Tickets will be distributed via an online ticket lottery, which was was open from noon Friday through noon Wednesday. Tickets are free of charge and cannot be sold. Winners will be notified via email and will receive instructions for getting their entry tickets. More than 35,000 people are expected to attend in staggered shifts. "Let's Celebrate" is the theme of the March 28 event, which will incorporate aspects of First Lady Michelle Obama's Let's Move! health initiative. Aside from egg rolling, guests can enjoy live music, access to sports courts, cooking stations and storytelling. 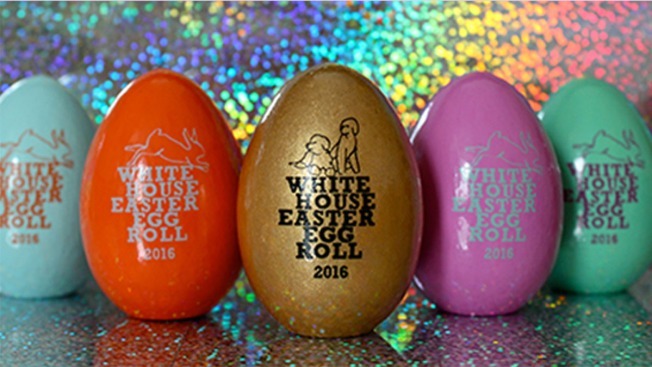 This year's egg roll will also include the first-ever White House Fun Run. The National Park Foundation will be producing and selling five souvenir eggs designed by graphic designer and blogger Joy Cho. The collection features four colored eggs with stamped signatures of the President and First Lady on the back and one gold "Bo and Sunny" egg with the stamped paw prints of the dogs on the back. Each child who attends the roll will receive a souvenir egg. Collectors can also opt to order the full commemorative egg collection, available online here. Additionally, the White House invites all elementary and middle school students to submit original artwork related to the "Let's Celebrate" theme to be used as part of the program and souvenir poster. Designs should be uploaded online here. Submissions for the contest will close Feb. 22 at 12 p.m.